Rockingham Ranch and Gelfenstein Farm's X Y Jet headlines Wednesday's featured ninth race at Gulfstream Park, seeking to punch his ticket for a third trip to Dubai. The popular 7-year-old gelding finished second twice in the $2 million Dubai Golden Shaheen (G1), a neck behind Muarrab in 2016 and a head behind Mind Your Biscuits last year. 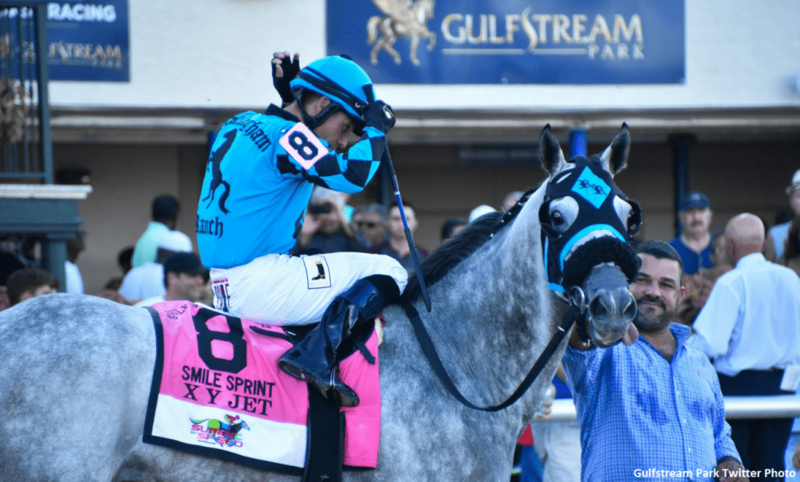 X Y Jet returned from Dubai last year to capture the Smile Sprint (G3) at Gulfstream on June 30 before heading to the sidelines for 6 ½ months. The Jorge Navarro-trained son of Kantharos was upset in his Jan. 19 return in the Sunshine Millions Sprint, in which he came up uncharacteristically short to finish fourth after breaking from the rail post position and being subjected to heavy pace pressure. X Y Jet, who has earned $1.5 million in purses, will break from the outside post position in a nine-horse field for Wednesday's six-furlong optional claiming allowance. X Y Jet's last 12 starts have come in stakes competition. “I want to go easy on him to get him ready for Dubai. Dubai is our main goal.” Said Navarro, who has given a return call to jockey Emisael Jaramillo. In addition to saddling X Y Jet for a pair of runner-up finishes in the Golden Shaheen, Navarro also trained Sharp Azteca, who finished third in the 2017 Godolphin Mile (G1) in Dubai. Wednesday's optional claiming allowance will mark the return of Repole Stable's Nobly Indy, the 2018 Louisiana Derby (G2) winner who has been sidelined since finishing off the board in the July 7 Dwyer (G3) at Belmont Park. “He's training well. I think the six [furlongs] might be a tick short for him, but he's ready to run. The goal is to get a race to set him up for something longer down the road,” trainer Todd Pletcher said. Noble Indy launched his career with a pair of victories during last season's Championship Meet at Gulfstream before finishing third in the Risen Star (G2) and winning the Louisiana Derby at Fair Grounds. The newly gelded son of Take Charge Indy finished off the board in his next the starts in the Kentucky Derby (G1), Belmont Stakes (G1) and Dwyer. John Velazquez has the mount aboard Noble Indy. West Point Thoroughbreds' Reason to Soar, who finished second behind X Y Jet in the Smile Sprint, will seek to rebound from a fifth-place finish in the Sunshine Millions Sprint, in which he was returning from a 6 ½-month layoff. My Carrots, Santiamen, Millionaire Runner, Cove Blue, Timber Ghost and His Name is Sue round out the field. Gulfstream's 10-race program Wednesday will begin with a first race post at 12:35 p.m. This entry was posted in NL List, Racing and tagged dubai, dubai golden shaheen, gulfstream park, jorge navarro, noble indy, x y jet by Press Release. Bookmark the permalink.